So I’ve already put this up on the Advocacy Tools page and on the Facebook page, but I just wanted to talk a little bit more about the Narcolepsy in the Workplace info sheet I’ve created and the reasoning behind it. The idea for this document came from a commenter on this blog, Lisa, who requested something to help her explain her condition to employers and co-workers, talk about appropriate accommodations and ease the sense of isolation she was feeling in her job due to other peoples’ misconceptions. When I received this comment I thought about how often I’ve seen this problem come up for people with narcolepsy, and I really wanted to do something to help. The problem was that a question instantly loomed in my mind: How can I make this relevant across the vast spectrum of people with narcolepsy? From being in several different narcolepsy groups, I know that some PWN are unable to work due to the severity of their condition, while some on the other end of the spectrum are able to manage successful full-time careers. Some need to take naps during the day to be productive (like me! ), while others prefer to keep moving and on their feet to fight off sleep. 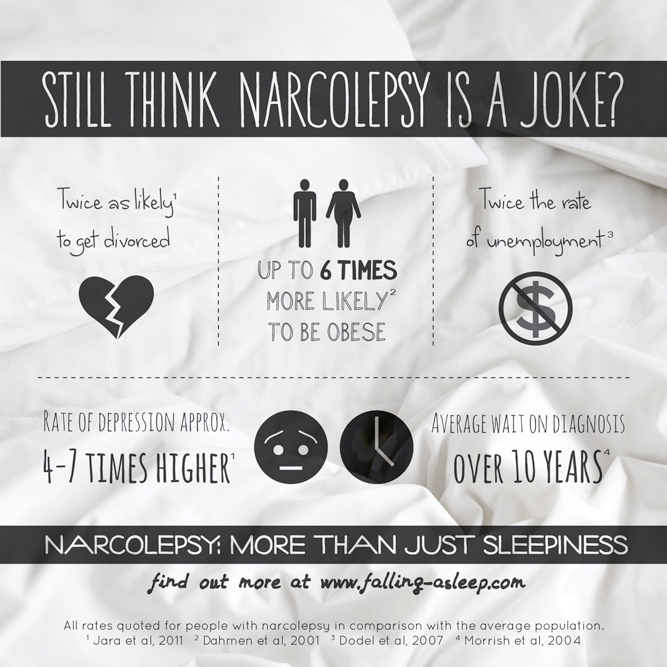 Even within one individual person with narcolepsy, symptoms can vary so much from day to day. I’m sure we all know that variation is in the nature of our condition, but it is one aspect that is very difficult to make other people understand. In the end, I decided that the only way to go was to explain that this variability is a big part of narcolepsy, and that discussions between the person with narcolepsy and their employer are ultimately the only way for there to be a clear communication about the needs of the individual. I don’t feel like there is a way for me to create a one-size-fits-all document that you can just hand to your employer and walk away. Despite this, I still wanted to help by creating something that would help to facilitate this dialogue. The document I have come up with is intended to provide a kind of “backup” for a person with narcolepsy in this type of situation: providing the facts so that you don’t seem like you are making it up (which sadly seems to be people’s perception in some situations!) and providing constructive ideas on how to improve on problem areas. It explains in clear language that narcolepsy is a real disorder, and that reasonable accommodations are a right that we deserve, just like any other person with a chronic illness. The list was put together from my own coping methods, other web sources, and of course the input of other people with narcolepsy – a big thanks to everyone who contributed their ideas and experiences! In the end, I think it is a real shame that there are people out there who refuse to accept the validity of a person’s explanation of their own condition. It is kind of funny, in a twisted way, how much of an impact it can have to add a printed sheet of paper to your argument. This is partly due to the power of design, a power I am trying to harness for good in many of my projects here! It can also have to do with the emotional investment of the person… I know I sometimes have a hard time speaking on topics like this which bring up feelings of frustration and fear, so the info sheet offers an impartial source of information that can help to diffuse these situations. 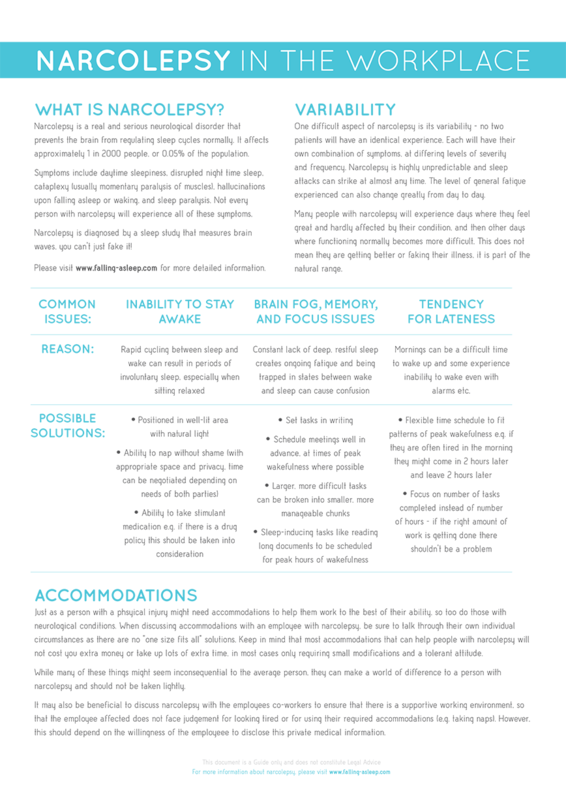 I know that a sheet of paper can only do so much, especially in the difficult and multi-faceted task of managing narcolepsy in the workplace, but I hope that this will at least help some of you with the struggle. P.S. If you have any other ideas for resources that might help you or other people with narcolepsy, please let me know! I used to teach in a public school in the US and presumed that notifying my administrators of N would assist in overall job stature and performance. Perhaps it did in some ways. My point is that letting employers know can backfire too. The protections of the ADA here simply mean that HR may now see you as a “defective” and attempt to try and remove you by some indirect means.